WanderMan: More Low Carb "Cheats" - How To NOT Feel Like You Are Missing Out! More Low Carb "Cheats" - How To NOT Feel Like You Are Missing Out! Lately, I have been writing some articles about low-carb cooking, recipes and products. My goal is to replace the high carb versions of what I miss with low carb versions that still taste the same. That's the real trick. So many low carb versions of things just don't taste the same as their counterparts. You end up feeling like you are missing out on something. That leads (for me at least) to a nagging train of thought that keeps me thinking about what I am missing and trying to rationalize just having a small amount. It's a slippery slope for me! Next thing I know, I'm eating ice cream and pretzels (delicious by the way) out of a tub while watching TV. Let's explore a substitute for something I used to always take on RV trips. The simple and tasty granola bar. Take a look at the calorie and carb counts for an average granola bar. Believe me, I was as shocked as you when I realized just how energy dense these things are. I don't care, I like them. They happen to be good as a snack with coffee, or on the run when you just need something to nibble on. For the last couple of years I have been reading granola bar labels and hoping for one that would be "guilt free." It's been a long wait, but new products have been rolling out over the last few months that fit the bill perfectly! The first one I came across in the supermarket was Nature Valley protein bars. They come in some pretty great varieties; Salted Caramel Nut, Honey Peanut Almond, Coconut Almond and Peanut, Almond & Dark Chocolate. They really taste amazing and the texture is spot on. These are mid way between crispy and chewy bars.. Just the way I like them! If you are minding carbs, these are pretty low, especially if you subtract the dietary fiber (I do) 14 grams - 5 dietary fiber = 9 Total Carbs! (6 grams Sugars) I am eating around 65 grams a day to maintain my weight. Remember that's an average by the week, so I don't go crazy counting everything all the time. So these are a pretty guiltless snack. Be aware they do have 190 Calories as well. The main issue is price. 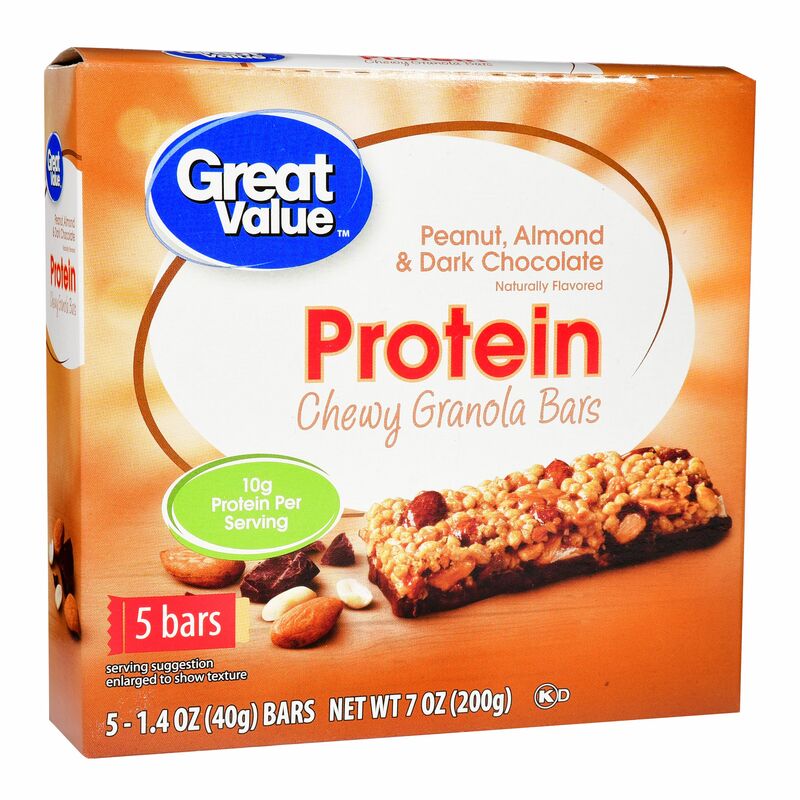 They are around $5.68 for 10 or $3.89 for 5 bars. Not terrible, but significant. That being said, Walmart's brand, that just came out, is as good or perhaps a bit tastier than the originals and they are only $1.92 for 5. Right now there are only two varieties available, but they are good! Same nutritional values. I keep a few in the car and sometimes even one in my pocket for an afternoon snack. You can avoid temptation and get to eat stuff you like without feeling guilty! It is possible. I'm proof. I'll keep finding substitutes and moving forward. In follow-up articles I will be writing about guilt-less pancakes, cookies, cakes, biscuits and yes...even pasta! Ice cream too!! Stay Tuned! I will be looking for these on my next trip to Walmart. Thanks for the heads up. I've been doing low-carb for quite a while, and have taken it a bit further with restrictions for no HFCS, organic, etc. Have you pushed those boundaries yet? Nope. And likely going to either. Thanks. We'll take all the suggestions we can get. My pleasure...I know how difficult it can be! Every little bit helps.